In just a few days the 2018 edition of our Silver Britches will finally be hitting the gridiron once again as we face off against FCS (formerly 1-AA) foe, the Austin Peay Governors, on Saturday September 1st at 3:30 PM in that football cathedral known as Sanford Stadium in Athens, GA. 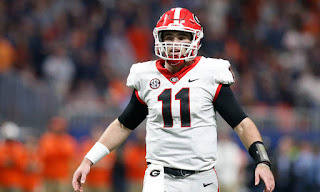 It was almost 8 months ago that the Dawgs, fresh off the epic victory over Oklahoma in the Rose Bowl, had their hearts ripped out of their chests when a true freshman QB came off the bench & somehow found a way to will the Crimson Tide to victory The cruel suddenness of it was not unlike the SEC Championship game in 2012 as well as the fact that if not for Alabama, UGA would've very likely been twice-National Champions in the past six years. Oh well, things seem to happen for a reason. And all of that's in the past, and unlike almost six years ago - things feel different now. 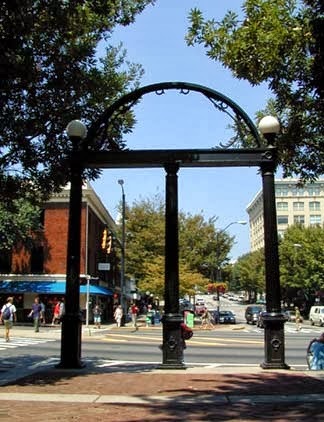 It doesn't seem like UGA is a doomed Charlie Brown caricature anymore, constantly tormented & cursed. No, it feels as if we're right on the edge of a glory that we haven't seen since the early 80's & that feels pretty damn good. So let's break it down. While losing guys like Roquan, Chubb & Sony will be hard to overcome, many - myself included - truly believe that from top to bottom, this year's team might actually be better than the 2017 squad. Whether it's the embarrassment of riches we find ourselves with on the O-line, the top-notch running back by committee we'll likely see, or perhaps the best receiving corps UGA has had in years, there's a lot to feel good about; however, there are question marks, mainly on the defensive side of the ball with multiple starters & contributing key personnel gone. And what of the schedule? Many have been nervously looking at our 2nd game in Columbia on September 8th, but I'm not so sure about that one. USCe lost a good bit of firepower & I think they'll be trying to get their feet under them as much as us & talent will carry the day. LSU on October 13th in the "Red Stick" does bother me a bit, and I wouldn't go to sleep on Kentucky up in Lexington in November, either; and naturally Auburn, even in the Classic City, will be a tough one. And chances are we'll have to face the best quarterback in the league when we go to the other Columbia. With all of that said, though, there's a lot of folks out there that think Georgia has a pretty manageable schedule, and I'd probably agree with that. Coaching? We seem to be in good shape there, don't we? Kirby, after all, is Kirby, and we've got Jim Chaney & Mel Tucker once again leading the offense & defense, respectively, though we do have two new assistant coaches. Cortez Hankton takes over the WR duties & Dan Lanning will be coaching up the outside linebackers. Then there's the intangibles, or the X-factor, as it were. Things just feel different now. No longer does it feel as if there is a millstone hanging around the neck of this program. 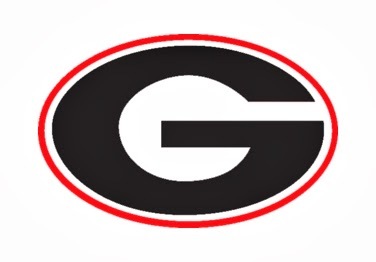 Gone is the general sense of malaise & dysfunction that followed the Dawg Nation for so many years. We not only think we can get it done - we know we can get it done. Enthused optimism & collegiate gusto - with the players, the coaches, the fans; with everyone - abounds. It's a nice feeling. The offense is going to be good. This much we know. The other day I saw a fellow Dawg Blogger say that we'll average 40 points a game! Man...that'd be something else, and you know what - I wouldn't say it's an impossibility. Let's start with QB. Jake Fromm, after a most impressive campaign (2600 yds passing; 24 TDs) as a true freshman, looks poised to be one of the SEC's premier quarterbacks this season. Of course, #1 is on the minds of many. Justin Fields, the 6-3, 225 lb "Cam Newton" wowed everyone in the G-day Game with his 200+ yards in the air & several nice runs. Controversy? Not really. I think Fields will see playing time right away here & there, but Jake is the guy, and I think everyone knows this. 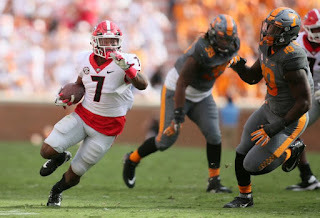 As we mentioned earlier, we have a veritable plethora of running backs, and I believe we will see an all-hands-on-deck/RB-by-committee approach w/ D'Andre Swift (#7 | 5-9; 215 lbs) as the primary with both Elijah Holyfield & Brian Herrien making significant contributions. And the true freshman, James Cook, continues to impress everybody in Summer Camp. D'Andre! He's a bad man, man! Again, the WR corps is just off the charts. The leader of this squad will no doubt be Terry Godwin (#5 - Senior - 5-11; 185 lbs). He'll be Fromm's go-to target & he's got the athleticism & skill to handle that role. As many have mentioned, what's so exciting about 2018 is the breadth & depth of this group. Riley Ridley's coming out party in the National Championship game was great to see. He'll be racking up a lot of yards & touchdowns while Mecole Hardman might be the best one of the bunch. It's the next level that's so impressive. A strong argument could be made that UGA's second-string group of WR's is better than most of the SEC's first-stringers. And leading that group of the best of the rest, in my opinion, is Newton's own - JJ Holloman (#9 - Sophomore - 6-2; 200 lbs). 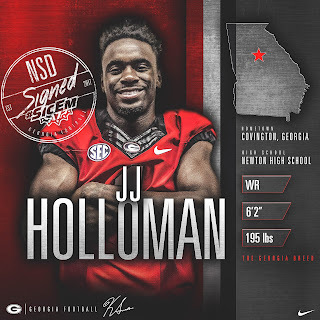 For years UGA has been referred to as "Running Back U," and that's certainly an apt description; however, we could just as easily be called "Tight End U," and 2018 will be no exception. Isaac Nauta, Jackson Harris & Charlie Woerner are all SEC starting material. They all have their strengths & could all have good years (if Chaney remembers they exist...). So basically we're stacked at all of the skill positions, and that's great. But it wouldn't matter much if we didn't have full stable of top-shelf O-linemen, and, brother, we sure as hell got that! 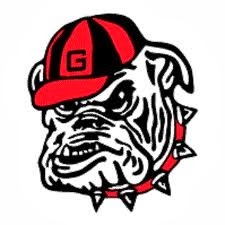 It seems as if most of the Bulldog Nation's hand wringing teeth gnashing slight anxiety is on this side of the ball, which I still really don't get. I mean, yeah, I get it. Roquan's gone. And so is Lorenzo & a couple of others, but again - just like with the team as a whole - I really think that the D, across the board & in terms of depth, will be better than 2017. The D-line has some worried & I just don't get it. 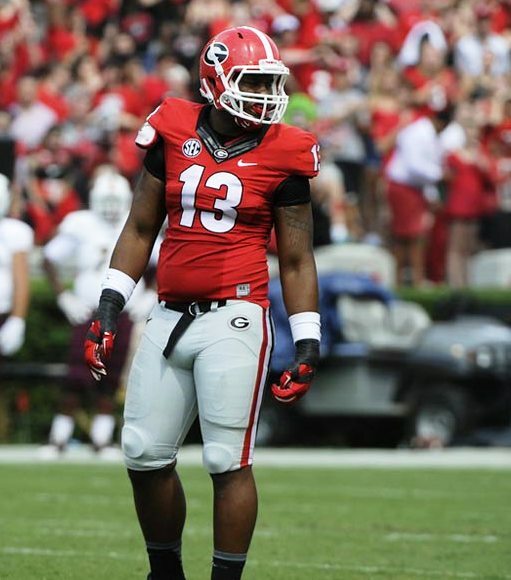 Jonathan Ledbetter, lucky # 13, is beast of a DE & will be complemented by Rochester & Clark, with support from DaQuan, David Marshall et al. They're gonna be a great crew. The Linebackers are going to be a very strong unit, I believe. We've got a lot of talent & several of these guys got in some quality time last year. But like just about everyone else has said, the key to whether or not this group will be exceptional will come down to Natrez Patrick. If he's good to go, we're good to go. And I think D'Andre Walker is gonna have a helluva year. Hell, 5 & 1/2 sacks & 13 & 1/2 tackles-for-loss last year as a back-up? It'd seem logical that he's going to be something special. Same with the secondary. The other Deandre - Deandre Baker - as well as the blitzman, JR Reed, will be in good company with LeCounte, McGhee, Webb & the rest of the gang. It might take 'em a few games to jell as a unit, but once they do, I think they'll be one of the best secondaries in the SEC. The kicking game. So important. Rodrigo Blankenship...that's all you have to say. And we got a little spoiled with our punting last year, but let's not forget that Marshall Long did a pretty solid job back in 2016. I think we're good. And coverage & protection should be on point, as it always is when Kirby's involved. 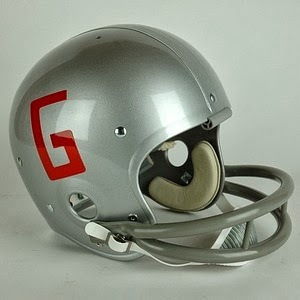 I can see this team going 12-0 this season, but I can also see a loss in either Baton Rouge or maybe even Columbia, MO. And there's always that fear of a trap game or a Murphy's Law day. I also worry about what should be a much improved Tech team at the end of the gauntlet. With all of that said, I'd be surprised if we are not back in the SEC Championship game. if we can win that one - then depending on the lay of land (and our record) - we'd be right in the mix for the Final Four. We shall see. Regardless, college football is finally back & that is an awesome thing! 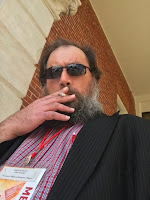 - MB McCart, Editor of The Piedmont Chronicles; Owner/Operator of Go You Silver Britches! Welcome back to GYSB, and How 'Bout Them Dawgs! 13 days away now. You can practically taste it! First off, let's deal with the bad news. Zamir "Zeus" White, the second coming of #34 in the eyes of some, blew out his ACL yesterday in Saturday's scrimmage. Very sad. 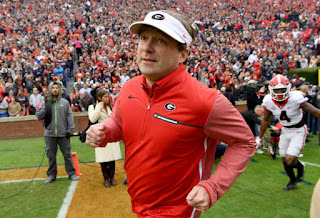 Some naysayers are already wanting to point blame at Kirby for having Zeus working special teams, but that's crap. You want your best players out there. The one silver lining is that we do seem pretty deep at running back w/ James Cook continuing to impress in addition to our 1,2,3 punch of D'Andre, Holyfield & Herrien. Hopefully Zamir will make a full recovery & will be ready to go for the 2019 campaign. 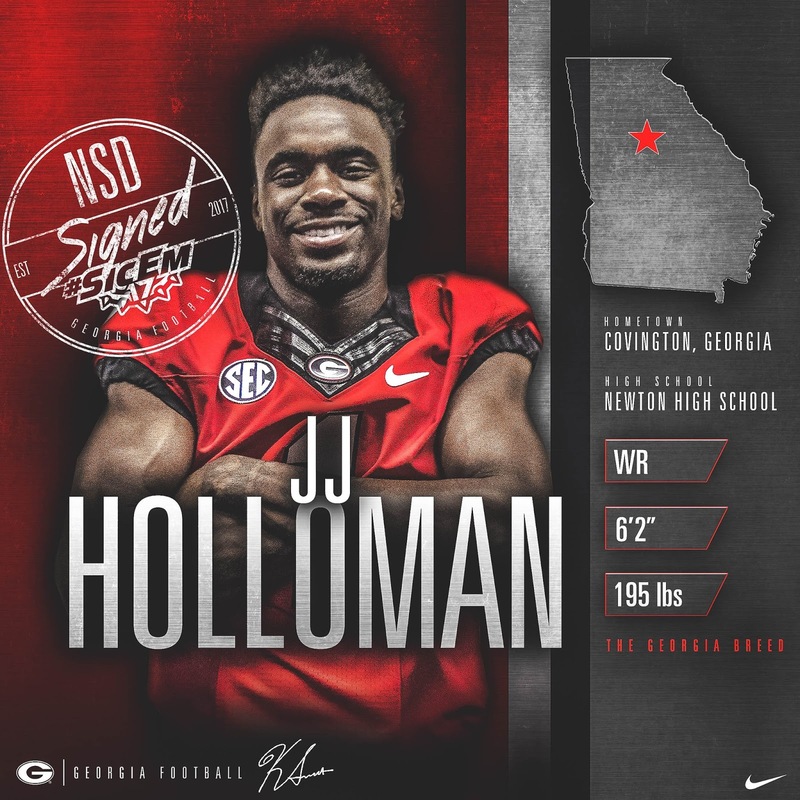 A lot of positive chatter about the receiving corps w/ Newton County's own JJ Holloman, in particular, getting kudos. I honestly believe this is the best group of receivers the Dawgs have had in some time. 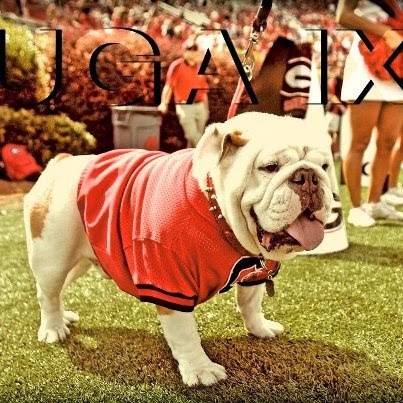 With our wealth of talent at QB, RB, tight ends & O-line, it's not surprising that some are predicting UGA could average upwards of 40 points a game this season. But there are question marks for many, especially on the other side of the ball. We'll save most of that for our 2018 UGA Football Preview that will be out next week. At any rate, it's almost here & that's exciting! 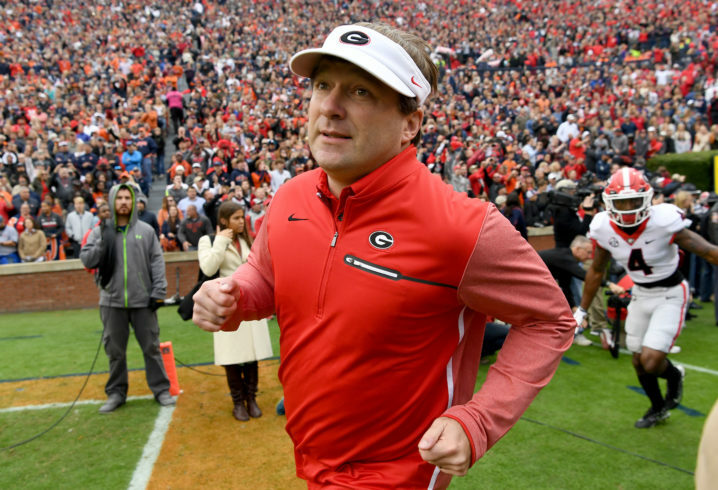 The Senator's take: Kirby had a "bad hair day"
Dawgs to open with Oregon in the ATL to start the 2022 season? Dude You Crazy mentions some former Dawgs that aren't on NFL rosters that will surprise you! Alright, folks, that'll do it for this go 'round. And again - keep an eye out for our 2018 Season Preview next week. As always, thanks for reading. GO DAWGS!!! GATA!